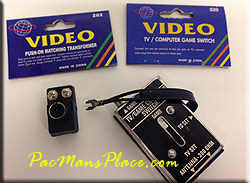 Connects TV (coaxial connector or antenna) to connect ATARI system via input plug. Easy lever switches between TV and Atari unit. BRAND NEW *Note, produced in 1990's some age wear to be expected. Comes with connector for modern Coaxial connection.